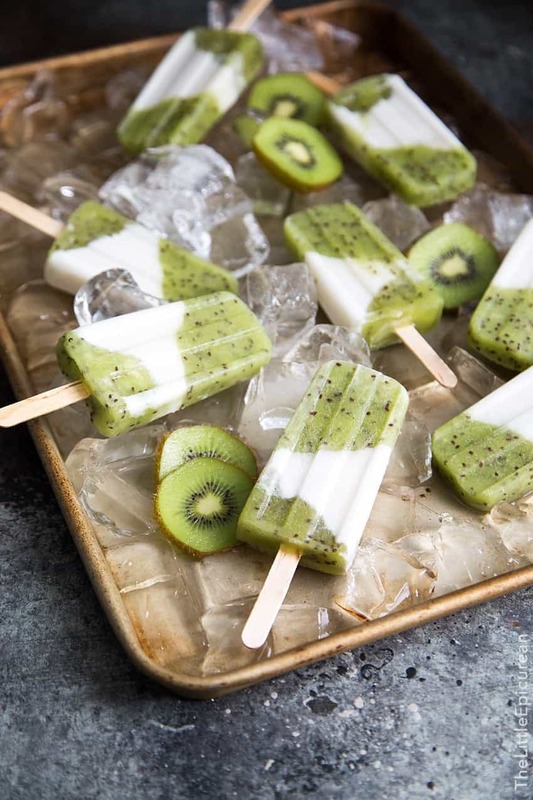 Simply made with 3 ingredients, these kiwi coconut popsicles are a must for summer. Creamy and sweet with just a kick of tartness, these frozen pops are sure to keep your taste buds happy! It’s #PopsicleWeek! It’s a deliciously glorious week devoted to frozen treats on a stick and it couldn’t have arrived at a better time. It has been HOT here in Los Angeles. Record breaking hot. So hot that I haven’t been able to take the pups on a proper walk in a week. The pups and I have been spending most of our time indoors. They stay cool nibbling on their frozen banana slices while I eat all the popsicles, ice cream, and sorbet we have stashed in the freezer for dire moments such as this. Last year, I made these boozy Pimm’s popsicles, along with a string of several other boozy pops: cantaloupe rum pops, watermelon tequila pops, and my FAVORITE kiwi coconut vodka pops. Feeling inspired after the success of my most recent kiwi coconut chia popsicles, I decided to try my beloved kiwi coconut combination for a third time. 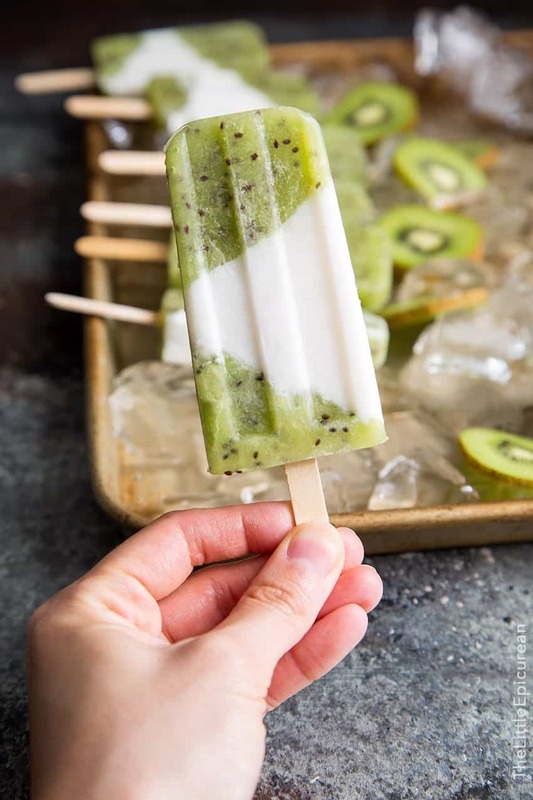 With just three ingredients, these kiwi coconut popsicles should definitely be on your summer to-do list! Kiwi and coconut are two very distinct flavors. Kiwi has a very unique sweet flavor with just a hint of tartness that makes it taste so fresh. While kiwi lend to brighter notes, coconut milk is the opposite. It’s rich, creamy, and silky. Paired together, you get the best of both worlds. 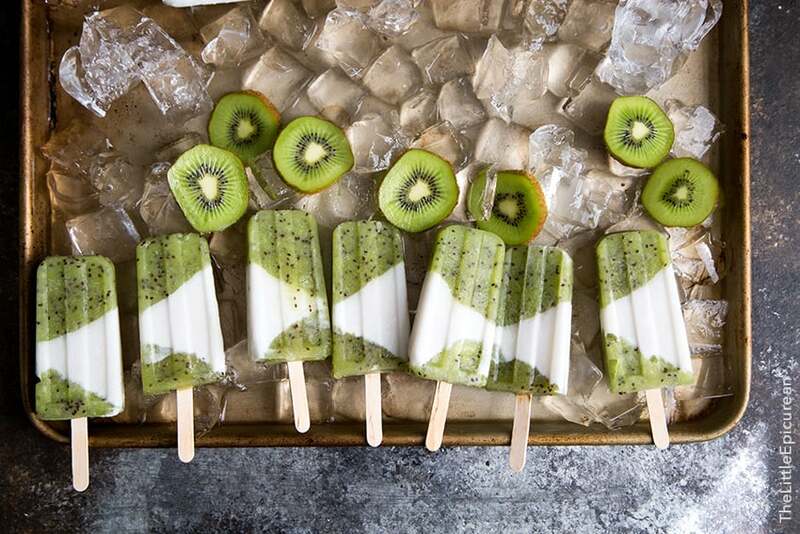 Unlike many other kiwi desserts, the kiwi in this popsicle is pure. Most kiwi based desserts don’t taste anything like kiwi. Kiwi has such a subtle flavor and I didn’t want any additional ingredient to mask it. I didn’t add any sugar to the kiwi puree. I intentionally frozen the kiwi and coconut separately to distinguish the two flavors. With each bite or lick (however you prefer to devour your popsicles), you get the choice of blending it together or eating them separately. 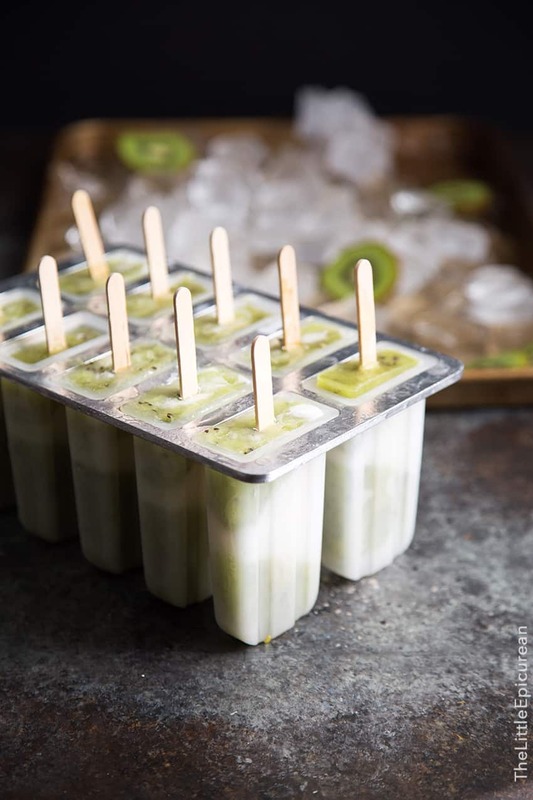 When you’re in need of a little tropical vacay, these kiwi coconut popsicles are bound to the hit the spot! Place peeled kiwis in a food processor. Pulse until smooth. Transfer to a container with a spout. Set aside. In another container with a spout, combine coconut milk and sugar. Set aside. To achieve the zigzag pattern, prop popsicle mold against another object in the freezer so it tilts to one side. Fill mold about 1/3 full of kiwi puree. Freeze for 15-20 minutes until kiwi puree is almost solid. Tilt popsicle mold in the opposite direction. Fill mold about 1/3 fill of coconut milk. Freeze for another 15-20 minutes until coconut milk is almost solid. Arrange popsicle mold so it is level inside the freezer. Add remaining kiwi puree. Place cover over popsicle mold and insert wooden sticks into mold. Freeze for at least 4 hours until popsicles are solid. Use unsweetened full-fat canned coconut milk for creamier popsicles. If you use light coconut milk or coconut milk packaged in cartons, the resulting popsicles may be a bit more icy. It is much easier to assemble and fill the popsicles with the mold in the freezer. these look great, especially with that green! it reminds me of a creamsicle in all the best ways. I love the distinct layers of these pops, Maryanne! And I love that you let the kiwi speak for itself without adding sugar. Mmmmm – I want one!